This vintage-inspired tin storage canister is from Restoration Hardware. I think it might be one of the only things I've ever purchased directly from their store. I fell in love with it about 10 years ago and Mr. Diy bought it for me. 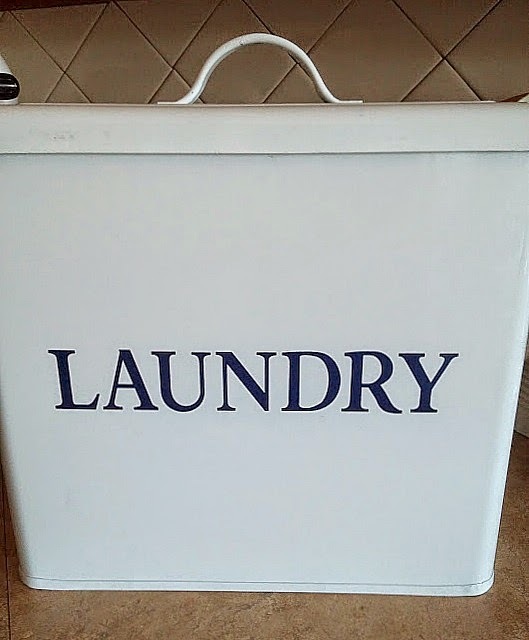 It's not really a bread bin...it's a laundry bin! Yes, the other side says LAUNDRY and it's meant to hold powdered laundry detergent. It comes with a tin scoop and I thought I'd be using it all the time. The thing is that with a top loading machine, there's no room to put this big canister. Also I really prefer liquid detergent (it's easier for my kids to use). And I'm all about my kids doing their own laundry! SO, this awesome tin box has been sitting forlornly on a shelf in my laundry room, collecting dust. What inspired me to make it a BREAD box? Well, I really don't have anywhere to store bread in my kitchen. I've been using a basket on top of the fridge but it's really hard for those of us under 6' tall to reach it. Reading a blog post by The Essence of Home recently, I saw something similar on her kitchen counter and the lightbulb went on. I have a Cricut diecut machine, I have black vinyl , transfer paper and the perfect font cartridge....I could totally do this! It was as easy as printing out the word 'BREAD', adhering the transfer tape, and applying it to to backside of my bread box. Why use transfer tape? It makes placing a word so much easier!!!!! Trust me, I used to peel off each letter and stick it where I wanted it, then get the next letter and try to match it up. It always looked awful. The transfer tape is a sticky tape that sticks to the front of your entire vinyl word...so that once you peel off the backing of your vinyl, you can see exactly where you are placing it - and it goes on in one piece! You stick it down, rub it with something stiff (like a credit card) and then peel the transfer paper off. The vinyl stays behind. It really is a brilliant solution! If you ever want to remove the vinyl, you just peel it off. 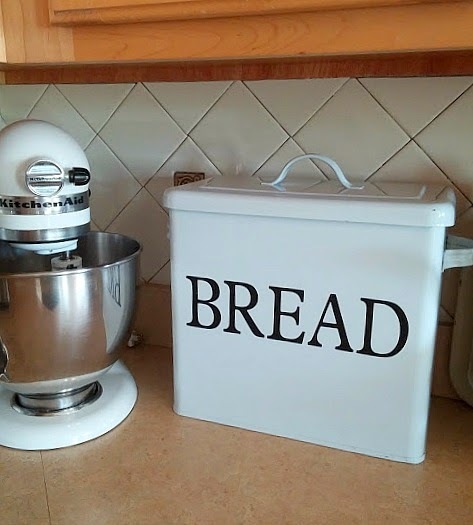 I am loving my new bread bin. Everyone can reach it and it looks really cute in this corner by my canisters of flour and sugar. 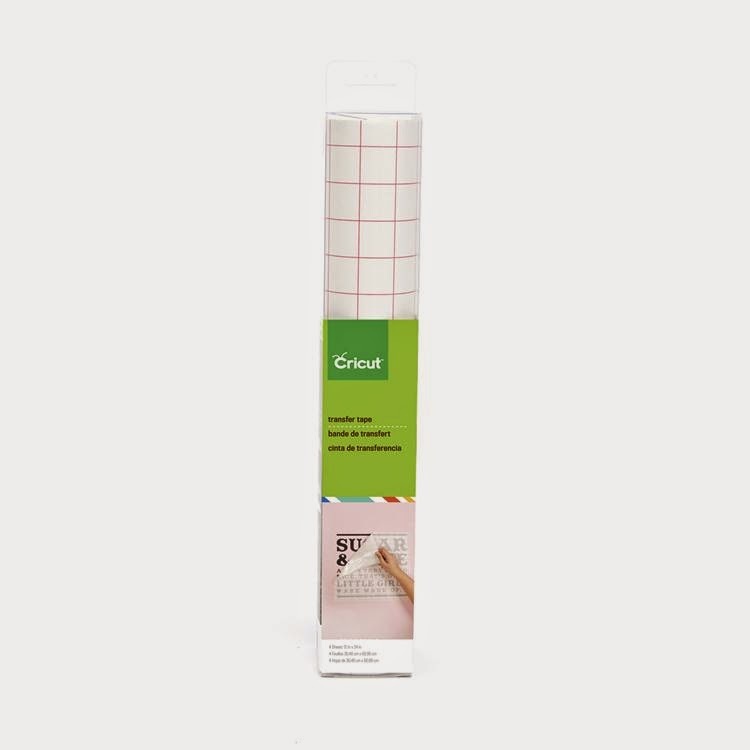 Right now on Cricut.com, they are having a sale on many of their products and their Transfer Tape is 33% off! You know this is a great deal because coupons never work for Cricut products at craft stores! 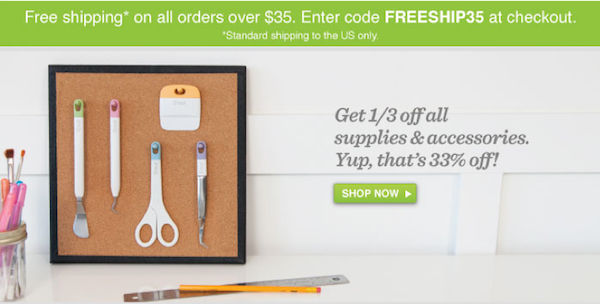 If that wasn't good enough...for a limited time, if you spend $35, you can also get free shipping with your Cricut order! If you're a fellow blogger and you are working on monetizing your blog, you might want to consider signing up with the Cricut affiliate program! Especially if you are a crafting blogger or have an audience who might be interested in crafts, this is a great affiliate program to join. As an affiliate partner, you get a 30% off discount so you can get your own machine, materials, etc at a tremendous savings! You can sign up for the Cricut affiliate program here. Even if you don't plan to promote it, it's a great way to get discounted supplies for yourself! 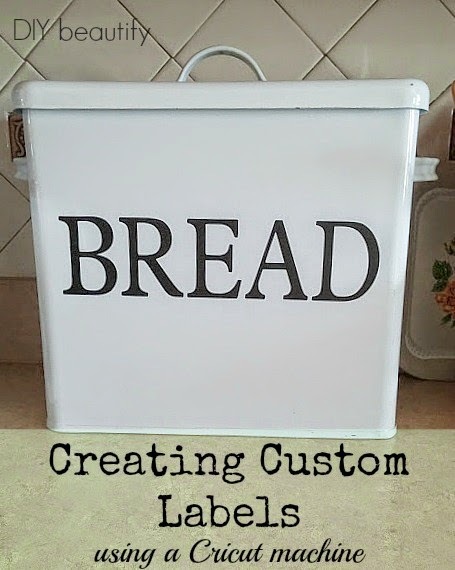 So here's a recap on my Restoration Hardware vintage style Laundry box...that went from unused to perfect bread storage in about 10 minutes, all with the help of my Cricut products! Do you own a Cricut? Have you ever 'saved' an item from a dusty corner with this little trick? I love those vinyl labels... This looks fabulous now! It looks super cute on your kitchen counter, and you can't tell the difference between yours and RH's! xoxo I don't have one of those machines; I'm not familiar with them. Thanks for the compliment ;) Cricut is like a Silhouette machine...only you make die cuts using cartridges that you buy. I've done SO much with mine; it's a great way to cut out letters and then use the stencil for painting signs! Thanks for your sweet comments, have a great weekend!! Really cute and a great example of using what you have in new ways! Yes, I can't believe it sat for so long unused...so glad I could pull it out, dust it off and start using it!! Cute redo! I have a laundry tin like that and I use it all the time. But good for you for redoing something that you don't use. We have to keep our bread in the fridge. With just hubby and I we don't eat it fast enough and it goes moldy if I don't. Thanks for sharing with SYC.